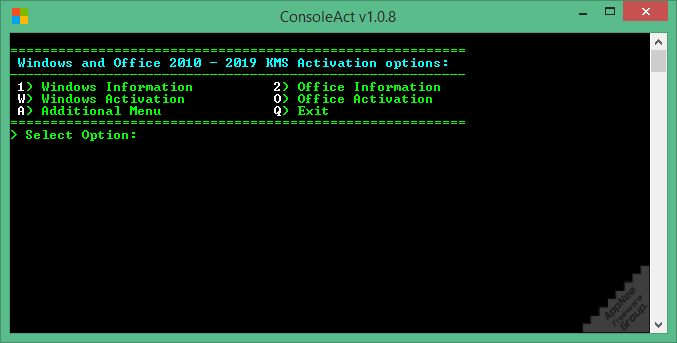 As a tiny console application for offline activating Microsoft Windows and Office products, ConsoleAct reminds me of Ratiborus’ another two classic console activators for Windows & Office: KMSAuto Easy and KMS VL ALL. Their common advantages are: compact file size, runs very fast, minimalist user interface, efficient and automatic activation process, and most importantly – they always more reassure those nervous users along with their sensitive antivirus software. Although ConsoleAct and KMSAuto Easy don’t allow to view their source code as KMS VL ALL does, however, it is well known that Ratiborus’ programs are almost always worthy of our trust. So, just enjoy another wonderful Windows/Office activation tool that he brought us! And as usual, share it with more guys with the same need, do not just leave it in some corner on your computer. /win=act Run program in hidden mode, activate Windows and exit the program. 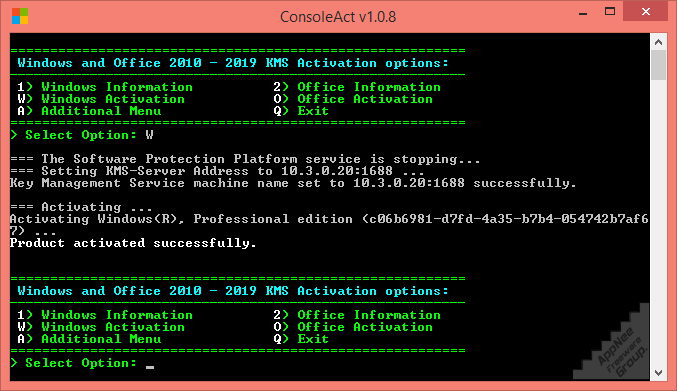 /ofs=act Run program in hidden mode, activate Office and exit the program. /wingvlk Run program in hidden mode, install Windows Key and exit the program. /ofsgvlk Run program in hidden mode, install Office Key and exit the program.